From Gund. 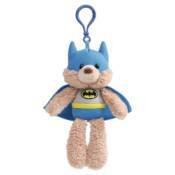 GUND is ready to save the world on-the-go with help from some of the DC Universe's most powerful superheroes. These plush backpack clip versions of Fuzzy Bear dressed up as DC Heroes are sure to please comic book enthusiasts of all ages.